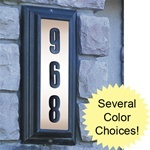 Lighted House Numbers | Address Plaques | Free Shipping! Lighted house numbers are now available from Home Products n' More! We offer low voltage lighted house numbers that can be personalized with your address, and in some cases, the street name too. 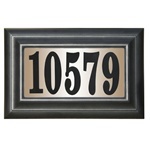 Choose from lighted house numbers in cast aluminum or lighted house numbers in durable vinyl. Many of the lighted house numbers shown here are available in more than one color option, too. All lighted house numbers come with free shipping and handling from Home Products n' More! Home Products n' More also offers a variety of lit and non-lit address plaques. 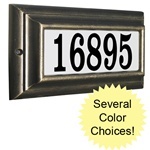 Our array of high quality lit address plaques feature energy-saving low voltage lighting. All our lit address plaques can be personalized with your address. For an elegant and classic look, consider our Edgewood series of address plaques. The Edgewood Oval Address Plaque and Edgewood Large Address Plaque offer 5 attractive finishes on a solid cast aluminum frame. 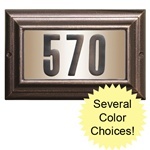 The Edgewood Standard Address Plaque is a slighly more economical option. Do you have a vertical application? Consider the Edgewood Vertical Sign. 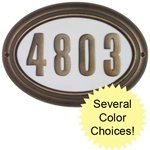 For something more affordable, consider the Edgewood Classic Address Plaque. It offers all the elegance of the other Edgewood signs, without the additional cost! We offer address signs in crushed stone and solid granite. Our crushed stone plaques offer two subtle color choices, while the solid granite plaques are available in a wide variety of colors, both polished and unpolished--a total of 10 granite colors to choose from! Please be sure to note the return policy for our personalized address plaques. We cannot accept returns of custom-manufactured products, unless the return is a result of our error. Rest assured that if we make a mistake on your sign, we will replace it at no cost to you! If you are looking for other items to spruce up your home and boost your curb appeal, you might also be interested in our line of arbors and pergolas. An arbor makes a lovely segway from a side yard into a back yard, and is also a great place to plant climbing vines and flowers. A white vinyl arbor also makes a beautiful backdrop for an outdoor wedding, and can then be gifted to the happy new couple after the ceremony is over.